The ability to travel light has so many benefits. You can run to catch your connecting flight or train without the struggle of lugging your baggage. You’re also never guessing whether you left anything behind, because everything should be in your hands or strapped to your back. With some expert planning and smart decision making, you’ll be ready to ditch that huge suitcase and start packing lighter and lighter. Ask yourself – Do I really need this? Only pack what you need. I promise, it’s a freeing feeling. Put everything you want to take on your bed and try to cut it down as much as possible. Also, try to leave your electronics at home. What are you really going to need that your smartphone can’t do for you? Of course, if you’re traveling for work, you’ll most likely need to take your laptop. However, if you’re going on a vacation, there should be no reason to take it. Make a list of just the essentials. This will help you to stay on track. I usually start with categories and expand on the items. This is just an example of what a packing light list might look like. You can always have more items and cross them off later if you realize you don’t need them. Clothes – Remember to pack in threes: three shirts, three pairs of socks, three pairs of underwear and three pairs of pants. Three outfits should suffice. Remember, you can always wash your clothes while you’re there. If you’re going swimming, don’t forget your suit. Also, hopefully, you can find just one pair of shoes that will cover your bases. If not, leave a little bit of room for an extra pair. Entertainment – Bring at least one book, a pen and some paper. If you finish your book while you’re there, you can donate it to a local library and use it as an excuse to buy a new one for the trip back. Snacks – Pack snacks that are sure to get passed security. Trail mix is a great option. Try some larger trail mix packages of Second Nature’s Simplicity Medley so you stay energized during your ride. Whether you’re traveling by plane or not, those tiny overhead compartments should come to mind while you’re packing for your big trip. If you can’t fit what you’re bringing in the compartment, you need to pare down. Think about the size and weight of your bag. If you can’t lift it comfortably by yourself, then there are definitely some things you need to get rid of. Whatever you decide to wear on the day you leave should be the most comfortable thing you own. Make sure that you’re comfortable enough to take a nap at the airport or train station. You never know how long you’re going to have to wait. Wear your sweater, jacket, sunglasses and a good pair of shoes. Slip-ons, flats and loafers work great for security checks, and you can usually wear them for just about any occasion. Layer on your sweater, jacket and sunglasses. 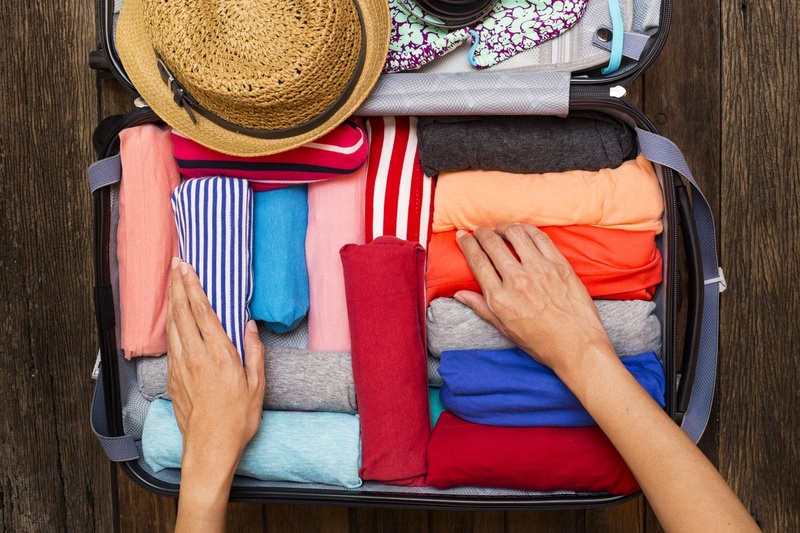 If you layer the clothes you wear to your destination, you’ll make more room to pack what you want. While you’re away, you might want to pick up some souvenirs for your friends and family back home. Try to pick small trinkets rather than lavish gifts. That way, if your baggage is lost or stolen, it won’t feel like a huge loss, and you won’t go home with more luggage than you intended. Remember, if you buy it, you’re flying with it. Anyone can master the art of packing light. It just takes the right frame of mind. Think light and simple and you’ll be bound for a lighter more carefree journey.